Sydney (AFP) – Sea Shepherd campaigners left for their tenth annual campaign to prevent Japan’s slaughter of whales in the Southern Ocean on Wednesday, with three vessels departing Australia for Antarctic waters. The Bob Barker, which was once a Norwegian to harass the Japanese fleet as they harpoon the giant animals, and prevent them from taking their full quota. Captain Peter Hammarstedt said it was his ninth campaign protecting whales, which have at times included high-seas clashes between the conservationists and the Japanese. “The Japanese whaling fleet intends to kill 1,035 whales of which 50 are endangered fin whales and 50 are endangered humpback whales, the very same whales that frequent the shores here off Australia,” he said. 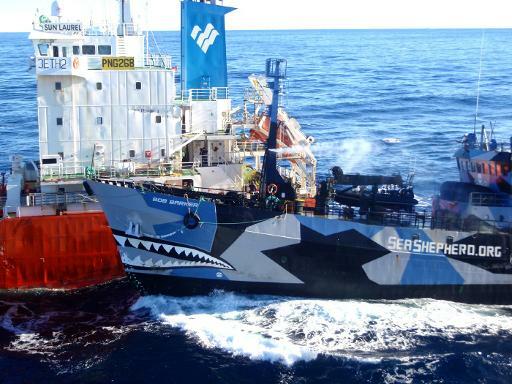 Sea Shepherd Australia said its two other boats the Steve Irwin and Sam Simon left Melbourne on Wednesday for the annual campaign it took over from the US-based Sea Shepherd Conservation Society in late 2012. The Australian government, which strongly opposes Japanese whaling, is expected to announce later this week that a Customs vessel will monitor the hunt. “The government’s commitment to monitoring in the Southern Ocean remains undiminished,” a spokesman for Environment Minister Greg Hunt said in an email. But the left-leaning Greens said the purpose-built Customs vessel that would be used was nowhere near the Southern Ocean, instead in waters north of Australia on a border protection mission. “It is purpose-built for the Antarctic, it is ice-rated, it is sitting off topical waters on Christmas Island,” said Greens Senator Peter Whish-Wilson. Australia wants Japan’s annual whale hunt in the southern hemisphere summer to stop and has taken the matter to the UN’s top court the International Court of Justice. A decision is expected in early 2014.